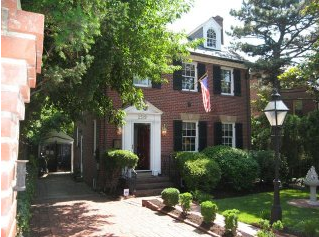 I don’t consider oil industry funded online petition drives run by lobbyists living in million-dollar Washington, DC homes to be grassroots organizing. 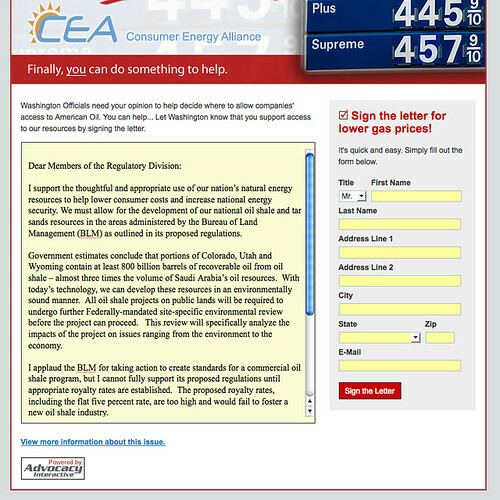 Yesterday, I stumbled across a fake grassroots organization called Consumer Energy Alliance. I believe I accidentally found this through a pop-up off the Minneapolis StarTribune.com. The fake grassroots organization is asking people to sign a petition to open up America’s soil to corporate strip mining for oil. And to lower the 5% royalty tax the government charges for oil extracted from public lands because paying 5% for oil extracted from public land is a burden for oil corporations. That’s a nice pad for a grassroots organization. Mr. Gibson has worked for or on behalf of the RNC, the NRA, and San Diego Gas & Electric. Whether you are looking to lobby Congress, influence Legislators, or introduce new products or services into the market reaching out to Opinion Leaders is the ideal way to start. This, to me, is a great example of why we need more transparency in government. Let’s start having some honest arguments about America’s energy policies rather than hiding behind fake grassroots organizations. Dear Michael C Gibson, stop manipulating the public on behalf of your clients. While it certainly brings home the bacon, I think you’d find that it’s easier to sleep at night if you were more honest about who’s behind the fake grassroots organizations you create. In all three cases, these are fake-grassroots “organizations” that are trying to influence elections and policy in a way that’s contrary to the people they pretend to represent. Drives me nuts. I got an email for this site and immediately realized its biased slant. What can we do to stop them from spreading this lie? And to stop similar efforts from other fake grassroots organizations? I’m starting by forwarding the email to the source, Community Strategies (info@csgrassroots.com), with a message giving them a piece of my mind. To get the real message through, write your Congressman and Senators. It’s easy to do at congress.org – just enter your 9-digit zip code and they’ll lead you to the appropriate contacts. They even make it easy to email all your elected officials at once. This group just called my house purporting to do a survey. It was nothing but a bunch of biased questions in favor of fossil fuels. A quick search revealed the group to be a shill for the oil industry. Define “grass roots.” Is Moveon.Org a grass roots organization? Also, get your facts straight. This project has nothing to do with “strip mining for oil”, but is seeking support to build a pipeline to transport crude oil from Canada to the Gulf Coast of the United States. What’s your problem with that? If you think the future of the automobile industry is dependent on lithium (also mostly imported)powered electric batteries, think again. Those Pop-ups come up all the time on the Star Tribune. If there’s a villain in this, it’s the paper. What’s my problem? Let’s see… a transcontinental pipeline reaching from Canada to the Gulf. Where were YOU when that platform exploded in the Gulf and ruined the water, business and lives, not to mention killed 11 people and millions of wildlife, because of an oil spill? Doesn’t it seem a little risky to build a pipeline that stretches across the entire U.S. just to put more profits in Big Oil’s purse? I sure wouldn’t want that mess in my “yard.” And do you completely understand how they get the oil out of the tar sand? Probably not. It’s a mess and pollutes the environment around it! Consumer Energy Alliance is doing robo calls. Just got a call promising jobs and lower gas prices for the US-Canada pipeline to bring tar sands oil to Huston. Asked to use my info to send a message to State Dept to issue a permit for the pipe line. I quickly saw it was a front for something. Thanks for posting info on this fake grassroots org. Now they are working to spread lies among the community I love in to frighten people in voting to reject gas drilling in our community……..Never ends….